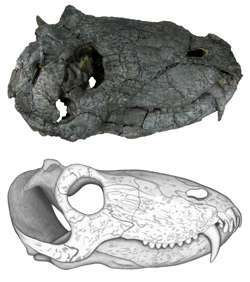 (PhysOrg.com) -- Back in 2008, budding paleontologists, Juan Cisneros and Cesar Schultz, still college students, found a skull in a part of Brazil known as the pampas region of Rio Grande do Sul. Theyd decided to dig there after studying images from Google Earth. Because Brazil is covered in so much vegetation, its difficult to find sites. Google Earth allows such researchers to see patches of open areas, so upon finding one, thats where the team went. Afterwards, they took pictures of their find and sent them back to their professor at the University of Witwatersrand, in South Africa, which is a sort of hotbed for fossil study due to the large numbers of specimens found in an area nearby known as the Karoo. After much study, the two finders of the fossil and a team from Witwatersrand, will have their findings published in the Proceedings of the National Academy of Sciences, and report that they believe the skull once belonged to a creature called Pampaphoneus biccai and is related to an ancient reptile found in South Africa called Australosyodon. The name theyve given it comes from pampas, the name of the open plains where the skull was found and the word for killer. Biccai comes from Bicca, the last name of the man who owned the land. Because they have only a skull to work with, the team has had to use the remains of other similar ancient remains found in South Africa, Russia and China to deduce what the reptile might have looked like. 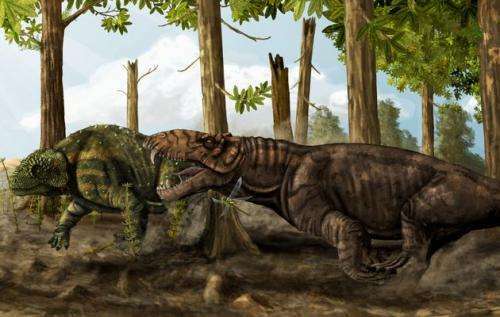 They believe it falls into the class Dinocephalian therapsid (reptiles with some mammal characteristics) and was about the size of a leopard, cold blooded, and had powerful jaws that enabled it to rip flesh from prey it very likely caught. Also, they believe it lived somewhere around 265 million years ago, putting it before the dinosaurs, which meant it also lived in a time when the continents were joined which explains how it could be so similar to other therapsids found in Africa and Asia. The team also believe Pampaphoneus biccai lived in herds because of footprint finds of relatives in South Africa. Scientists hope that the new find will help in plotting the migration of the ancient therapsids, which may help buffer arguments about the geography of the ancient continent known as Pangeae. The medial Permian (∼270260 Ma: Guadalupian) was a time of important tetrapod faunal changes, in particular reflecting a turnover from pelycosaurian- to therapsid-grade synapsids. Until now, most knowledge on tetrapod distribution during the medial Permian has come from fossils found in the South African Karoo and the Russian Platform, whereas other areas of Pangaea are still poorly known. We present evidence for the presence of a terrestrial carnivorous vertebrate from the Middle Permian of South America based on a complete skull. Pampaphoneus biccai gen. et sp. nov. was a dinocephalian mammal-like reptile member of the Anteosauridae, an early therapsid predator clade known only from the Middle Permian of Russia, Kazakhstan, China, and South Africa. The genus is characterized, among other features, by postorbital bosses, short, bulbous postcanines, and strongly recurved canines. Phylogenetic analysis indicates that the Brazilian dinocephalian occupies a middle position within the Anteosauridae, reinforcing the model of a global distribution for therapsids as early as the Guadalupian. The close phylogenetic relationship of the Brazilian species to dinocephalians from South Africa and the Russian Platform suggests a closer faunistic relationship between South America and eastern Europe than previously thought, lending support to a Pangaea B-type continental reconstruction. A "herd" of predators? Perhaps "pride" or "pack" would be better words here. "Pangeae"? I believe you mean "Pangea," since there was only one at the time. tadchem, maybe you were in a bit of a rush, as the article used the spelling pangaea.